I wanted to do a quick post before we left for our 4th of July extravaganza in San Diego!!! 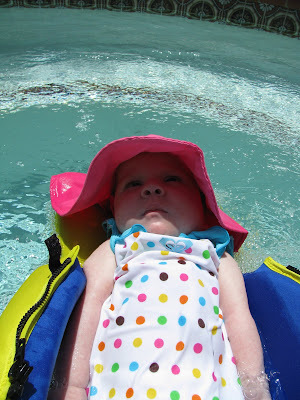 Kennedy and I will be soaking up the sun and enjoying the water for one week! 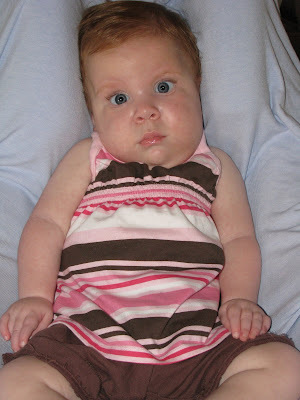 On Thursday, June 25, 2009 Kennedy slept in her own bed for the very first time! She only woke up three times that night to be turned and each and every time she feel promptly back to sleep. She is just doing amazing! 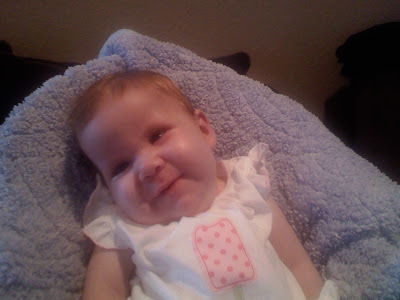 She is smiling more and more and really starting to babble. Also, Kennedy's best friend was born today!!!! Our very best friends Derek and Jen (Kennedy's Godparents) welcomed their daughter into the world this morning. Samantha Jean Smith was born @ 12:04 a.m. weighing 8 lbs 11 oz and 19.5 inches long. The Smith family is doing great - Congratulations!!!! 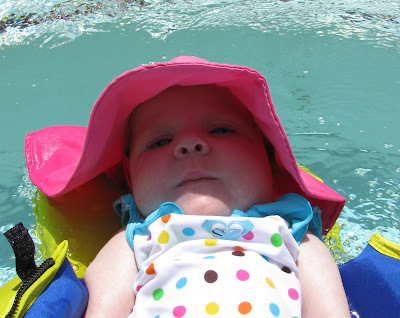 Today Kennedy and I headed over to Aunt Donna's for a little swimming and lounging. 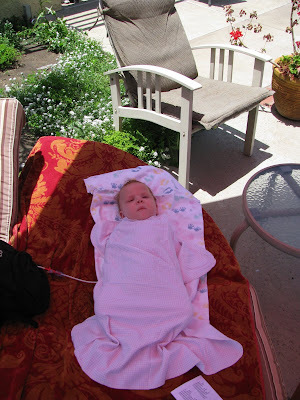 I have taken Kennedy in her spa once before and she loved it! I put Kennedy in her cute Roxy bathing suit (I couldn't resist during Chick's going out of business sale) and big pink sun hat. She absolutely loved the water. She was talking and smiling up a storm. I kept her in the water for about 45 minutes then she hung out on the lounge chair the rest of the time. 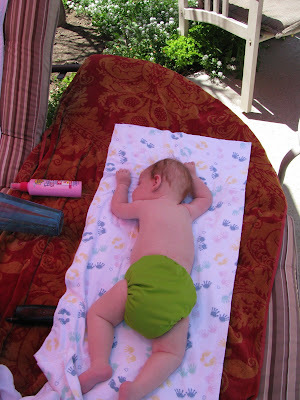 We are getting prepared for our big vacation next week to Campland in San Diego for July 4th - Plus, I needed to start working on some sort of a tan, because God knows tan fat looks way better then white fat!!! 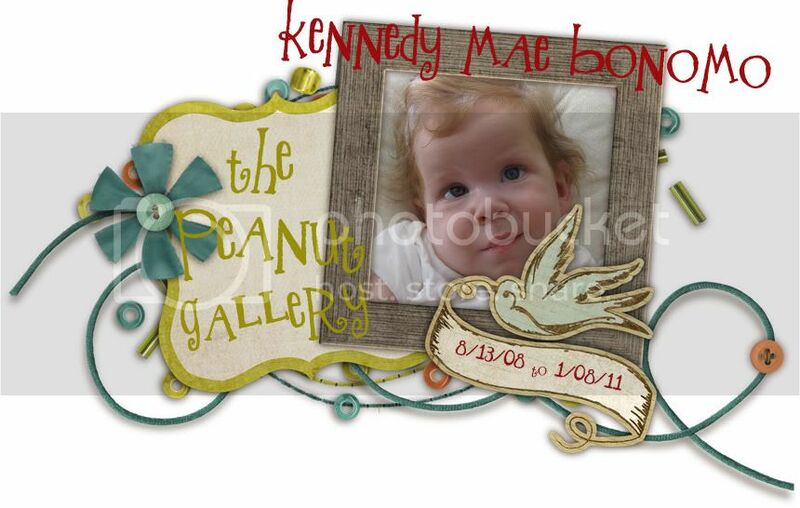 Last, Tuesday June 16, 2009 Kennedy's Great-Great Grandma (Nana) passed away. She was 82 years old - and a hell of a good crossword puzzler! She had 4 children, 17 grandchildren, 17 great grandchildren, and 2 great-great grandchildren. Yesterday, Wednesday, June 24, 2009 was her funeral. Again, another bitter sweet moment for me. As you hear from most people during these kind of tragedies, why does it take "these circumstances/death" to get all your family and friends together. Kennedy and I had a great time - we were able to see our family from Utah! Matt, Micheal, Aunt Kathy, Aunt Lynette it was so damn good to see you guys. I have missed you so. You have know idea how much I appreciate all of your prayers and e-mails filled with positivity and loving words. Jamie and Mandy - I can't wait to meet you guys. Kennedy must have loved seeing you yesterday because she was a chatty cathy. She was smiling and socializing up a storm (she must take after her Momma)! Well we look forward to hanging out with you guys in August and Matt your wedding in September is going to be awesome! I have included some pics over the past two years that I found of Nana......We will miss you Nana! So this weekend was extremely busy. The three of us were constantly on the go, which isn't necessarily a bad thing. Saturday the three of us went to a funeral for a friend of Brian's. Yes I brought Kennedy - I had no choice, there was nobody I could leave her with, but happy to say Kennedy was on her best behavior. Not a peep out of her the entire service! To me this funeral was bitter sweet. 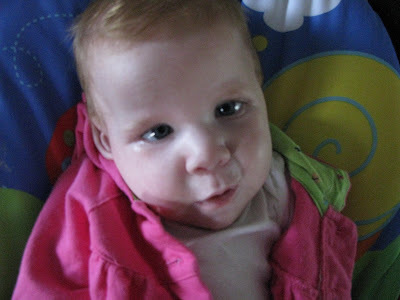 To tell you the truth, the next funeral I thought I would be attending was the one for my precious Kennedy! Furthermore, I feel that this road life has brought me down has made me a bitter soul at times - which I hope is just a temporary emotion. It was hard for me to sit at that funeral and look around at all those crying people and feel sorrow or empathy. Globally, I was sad for their lose, but I could not help but feel like the pain I feel inside is so much worse - the road my family and I are traveling on trumps everything. It is hard to mourn, feel sadness, exercise empathy, or show compassion to others in these times when it feels like you are still mourning and feeling sadness for yourself (sorry for the pity party). Moreover, Kennedy's great great grandma (Nana) passed away last Wednesday and again the sadness I felt was minimal. Am I cold hearted? It is hard to morn the loss of someone who has actually lived life. Both people were able to walk, talk, ride a bike, experience a first kiss, graduate high school, fall in love, get married and start families. It is moments like these that I would give my own life in order for Kennedy to experience. I hate that I feel this way, but I don't know how to get around it. I just don't feel sadness for other people right now - I guess I just feel like what I am going through is worse then anybody else (pathetic, I know). Please do not judge me to critically - trust me I am a fun loving, loud, sometimes obnoxious, sweet, caring, give the shirt of my own back kind of person. I just need to learn how to overcome this sadness in my life. I know that my life has already changed, but I am most scared that his situation will change the person I am (the person that everyone loves). I am not looking for anyone to feel sad for me, because I KNOW that Brian and I were chosen for a reason to be Kennedy's parents and I would not have it any other way. 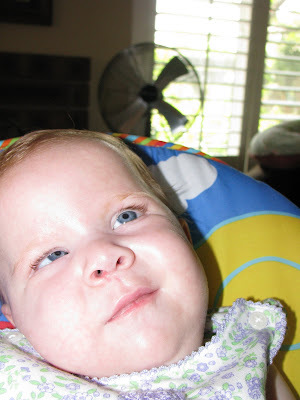 Every day I discover or learn something new about myself, my relationship, my husband, my family, my friends, the medical field, and people in general that I would have never known if it was not for Kennedy. On to more important things - KENNEDY! She is doing amazing! We have been home for exactly two weeks and Kennedy has been "wowing" me in some many ways. We do have some new equipment at home, more precautionary then anything - we were sent home with an at home suction system and oxygen for Kennedy to wear at night while she is sleeping. In addition, we have changed up her feeding regime in order to avoid any possible risk of aspiration due to food intolerance and/or spit up. She is on continuous feeds from 10 pm to 10 am and then has three small feedings throughout the day. This new schedule is working out really nice for the three of us. Kennedy has not spit up once and it gives Brian and I some more flexibility in the day - it makes planning outings way easier. 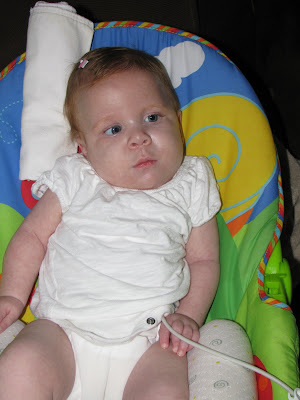 Kennedy was extubated on Saturday, May 30th and we never looked back. She was placed on nasal cannula for 12 - 14 hours post extubation at 1/4 liter and then was taken off nasal cannula the very next day - SHE DID IT! She is amazing! I feel so honored to call Kennedy my daughter. As usual the doctors came by and were amazed that Kennedy was doing so well. As we all know, everyone was counting her out about a week prior, but not me! I was not about to count Kennedy out until she was out. I stayed positive and up beat, because I am a firm believer that Kennedy can sense your mood and her surrounding atmosphere. From the day she was born I had a "no crying" rule set forth, that stated no one was to cry at Kennedy's bedside. She is fighting a tough battle and does not need to be surrounded with tears and sadness. When we are by her side she needs to feel positivity, happiness, and love! She needs to know that there is a reason why she is fighting. Attitude and positivity are everything - if I walked into Kennedy's hospital room acting exactly how I felt I would never want to step foot through her door, I would want to run away hide in a corner under the covers. Now that we are home Kennedy is surpassing all my expectations. She is smiling a couple times a day. 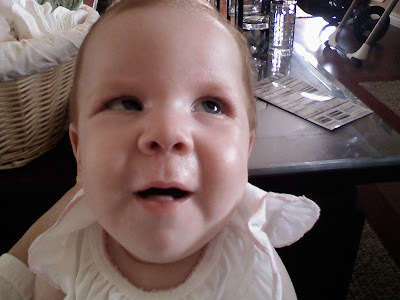 In addition, she is starting to babble (she makes repetitive vowel sounds over and over). That's right folks - Kennedy is babbling and smiling!!!! It may sound weird but she is actually doing the best she has ever done. She is not moving any more but her mind seems more on point. She is also not looking up anymore. She is making eye contact (periodically) and will focus and watch the TV. We have yet to see any of her doctors since we have been discharged, we missed most of our appointments while we were in the PICU, and rescheduling has been oh so fun. I mean, really, how can they booked out 'til August and why do I have to sit on hold for over an hour and still have nobody pick up the line??? I am very anxious to see Kennedy's pediatrician - I am dying to find out what he thinks is up with Kennedy's chest. When we arrived home a couple weeks ago Brian and I noticed that Kennedy's breast bone or sternum was protruding out and off to the left side - it sounds like she has Pigeon Chest?? I have no idea, so I am dying to get my foot into that doctors office and ramble off 20 questions.